The Flemish Giant is an old breed of domesticated rabbits, originating from the Flemish region. They have been bred as early as the 16th century around the city of Ghent, Belgium. It is believed to have descended from a number of meat and fur breeds, possibly including the Steenkonijn (Stone Rabbit – referring to the old Belgian weight size of one ‘stone’ or 3,5 kg) and the European “patagonian” breed (now extinct). This ‘Patagonian’ rabbit was a large landrace breed that was once bred in Belgium and France. The Patagonian breed was not related to the Patagonian rabbit of Argentina (Sylvilagus brasiliensis) a separate wild species which weighs less than two pounds (about 1 kg), nor the Patagonian hare (Dolichotis patagonum), which is a variety of rodent (classified as a Cavy) and thus cannot interbreed with domesticated rabbits. Thomas Coatoam in his “Origins of the Flemish Giants” tells us “The earliest authentic record of the Flemish Giant Rabbit occurred about the year 1860. At that time, in England, stories were being circulated by travelers having recently returned from Flanders, of the enormous size of the rabbits raised in that country and in parts of France. There are 7 recognized colors: blue, black, fawn, light gray, sandy, steel and white. Breeding season is in February. Flemish Giants do not handle heat well and therefore, pregnant rabbits do not do well during hot Florida Summers. Babies are ready for new homes at 8 weeks or older. Flemish Giants are placid and laid-back, docile and tolerant by nature. Because of this they do well with considerable handling, and are ideal for showing and as pets. Because of their large size, the Flemish Giants require a larger hutch than other rabbit breeds. They also require more food. 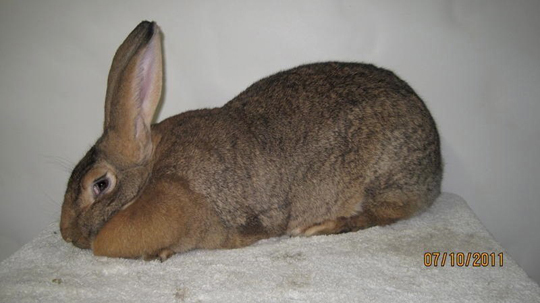 On average a Flemish Giant Rabbit will weigh 10-20 pounds or more when mature. Because of their large size they are not bothered by cats, hawks or other small mammal prey. Their short hair requires minimal grooming. They are easy keepers. Flemish Giants do not handle heat well. They would not do well in just any outdoor hutch here in Florida or in any hot climate. They would need shade and a way to cool down. We keep our rabbits in a climate controlled environment with air conditioning in the Summer. Depending on where you live, the same type of conditions may be a requirement of owning a Flemish Giant Rabbit. They love cantaloupe, strawberries, collard greens, parsley, cilantro, (of course) carrots, apples, pears, and they need lots of hay at all times. They also need a good pellet food for their main staple, but the addition of fruits and vegetables (a small amount each day). This ensures they are getting all their vitamins. Whole grain bread, oats (oatmeal) and barley are also a good additive. 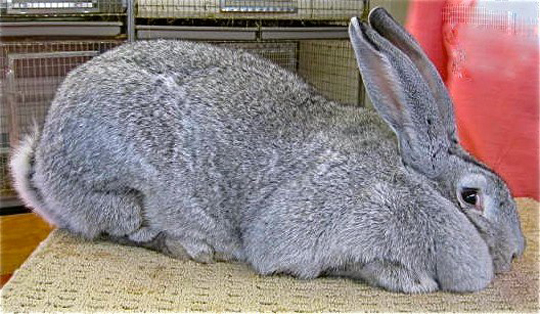 Flemish Giants are large rabbits that eat a lot. It is extremely important to have a good quality pellet food and plenty of hay daily. IF you add a vegetable one day, and the bunny gets diarrhea, STOP IT IMMEDIATELY. It is critical when a bunny gets diarrhea because they will dehydrate quickly. Make sure they have plenty of clean water available at all times.